The BIS has expanded its international debt securities (IDS) statistics by publishing additional details by currency and interest rate type. Whereas previously data by residence and nationality of the issuer were disaggregated only by sector of the issuer and maturity of the security, the BIS now publishes, for each sector, information about the interest rate - fixed or variable - and the currency in which issues are denominated. Data by currency distinguish between issues denominated in the local currency of the country where the issuer resides - for example, the local currency for UK issuers is sterling - and foreign currencies, specifically the US dollar, euro and other foreign currencies combined. For data by nationality of issuer, no distinction is made between local and foreign currencies; data are published for the US dollar, the euro and all other currencies combined. 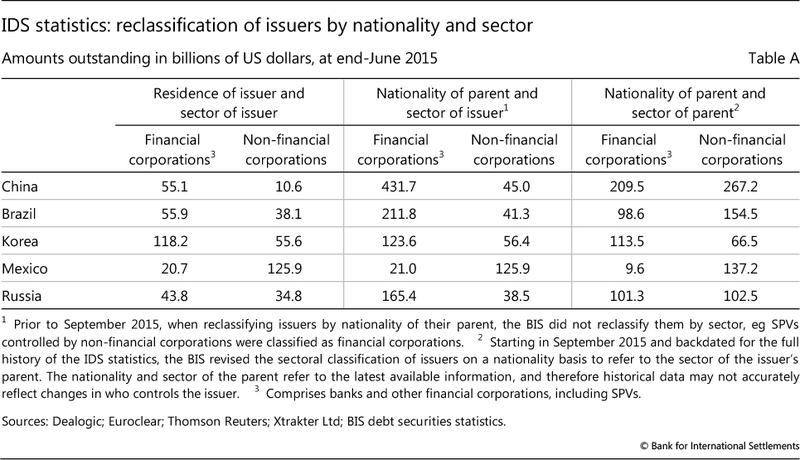 The BIS has also revised the sectoral classification of data by nationality of issuer. 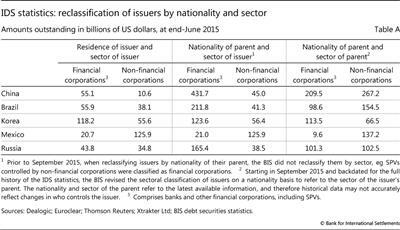 Previously, the sectoral classification of issuers by residence and nationality was based on the main business activity of the issuer. However, the main business activity of the issuer's parent entity may differ from that of the issuer. For the full history of the IDS statistics, the BIS has reclassified data by nationality to refer to the ultimate sector of the parent. For example, a special purpose vehicle (SPV) incorporated in the Cayman Islands and controlled by a Russian energy company is now classified as a non-bank financial corporation from the Cayman Islands on a residence basis but as a non-financial corporation from Russia on a nationality basis. Table A below shows the impact of this reclassification on issuers from selected emerging market economies. Amounts for non-financial corporations are much larger on a nationality basis than on a residence basis because of the reclassification of SPVs and other non-bank financial corporations controlled by non-financial corporations.